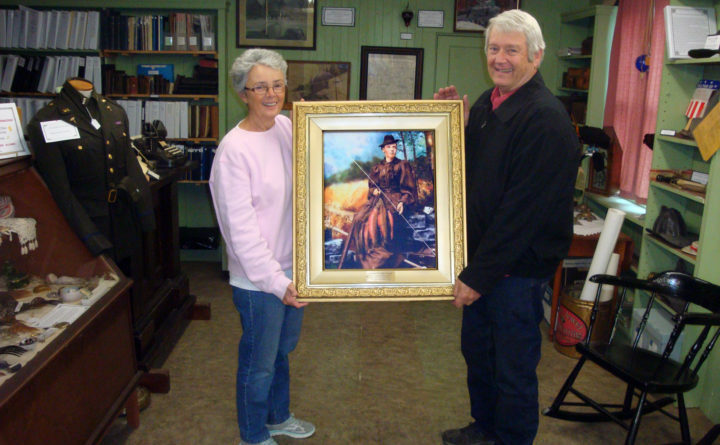 PHILLIPS — Fox Carlton Pond Sporting Camps has donated a canvas portrait of Cornelia “Fly Rod” Crosby to the Phillips Historical Society in celebration of the inaugural Fly Rod Crosby Days, being held May 18-20, at the sporting camps. “This canvas transformation of this famous image of “Fly Rod” [taken by Paul S. Caruso] was an undertaking by many talented individuals within our community. But most importantly, the dramatic colorization of the piece was orchestrated by Lori J. Dunn of Brownfield, an artist with local ties to our community,” said Jon Pound of the sporting camps. “Our celebration of Phillips Maine’s legendary sports woman, Cornelia “Fly Rod” Crosby is long overdue. Fly Rod was born and grew up in Phillips, Maine, the gateway to the High Peaks Region, and is noted for her fishing and hunting skills and her efforts at promoting Maine during the late 1800s and early 1900s as an ideal destination for outdoor sporting activities. For her accomplishments, Crosby most recently was inducted into the Maine Women’s Hall of Fame,” said Pound. The event also will feature a chance to visit with the fly fishing community and organizations that are supporting Fly Rod Crosby Days. For a complete list of events, go to: www.foxcarltonpond.com. For information on Fly Rod Crosby Days Celebration: Jon Pound, jon.pound1947@gmail.com, www.foxcarltonpond.com or 207-491-5865.